Social networking giant Facebook is looking to channel in on the way online transactions are carried out every day. And in an effort to leverage the retail side of it, the company has announced a new feature that will allow users to buy and sell products on its site, apart from allowing them to post an item for sale on the site. Facebook’s For Sale Groups new feature adds a “sell” button, which will appear beside the existing “post” button that makes it easier for users to buy and sell items. The new option gives space for a description of the item being sold, how much it is selling for, and the details of the delivery method. Sellers will be able to mark their items as “available” or “sold” and view a list of items that they have sold in the past. The social network today already hosts tens of millions of groups based around a variety of interests, and “For Sale” groups are one of the most popular categories. In these groups, members use Facebook as an alternative to something like Craigslist for local selling, or as an alternative to eBay for selling collectibles or other items of broad interest, like books or electronics. Currently, members in these “For Sale” groups generally post photos and text descriptions of their items, but the addition of the “Sell” feature will make filling out the necessary information a bit more structured than before. That will go a long way to help out group admins, who often have to remind members that they’re required to list a price, for example, or that they need to specify their general location or neighborhood. Facebook cited the case of Lisa Thayer, whose “Made by Mama Buy/Sell/Trade” for her crochet work attracted 4,500 members. It has helped many women turn their hobbies into businesses, Facebook said. Another case it cited was that of professional guitarist Kadu Carvalho from Rio de Janeiro, who created a Facebook Group to help musicians in Brazil buy and sell instruments. “In nearly three years, the group has grown to more than 34,000 members. Not only has the group enabled Kadu to personally buy, sell and trade musical instruments, it’s raised his profile and awareness for his band, Swell,” Facebook said. 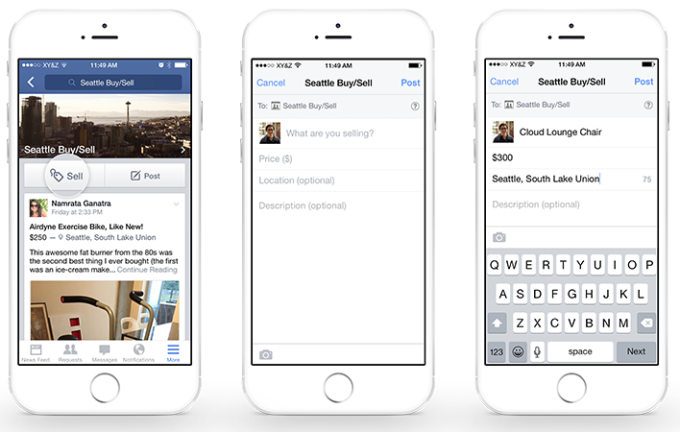 Facebook says the “sell” feature will roll out on iOS, Android, and online in the coming months.